A few weeks ago, we were treated to one of the more vicious rap beefs in recent memory when Pusha T scorched the earth with a particularly savage diss track aimed at Drake that almost definitely made the Canadian lock himself in a dark room and let tears run slowly down his face. Thankfully, Pusha only murdered Drake in a metaphorical sense as opposed to what rival crews used to do to each other in the Golden Age of rap feuds back in the 1990s. In the span of two years, Tupac Shakur and The Notorious B.I.G.— two of the biggest names (and the biggest rivals) in hip-hop at the time— were gunned down in incidents stemming from various intercoastal conflicts. There has been plenty of speculation about who was behind the murders but no one has ever admitted to having a role in either of the killings— at least until now. After attending a boxing match in Vegas on September 6, 1996, 2Pac and his entourage beat up rival gang member Orlando Anderson in a casino before eventually making their way to the Las Vegas Strip, where the rapper was gunned down after the car he and Suge Knight were riding in was riddled with bullets. Plenty of accusations have been leveled over the past couple of decades but it looks like we finally know who was behind the killing now that one of the men in the Cadillac that rolled up on the unsuspecting victims has opted to come clean. According to The Sun, Duane “Keefe D” Davis— Anderson’s uncle— decided it was time to tell the world what really happened on that fateful night after he was diagnosed with terminal cancer. According to Davis, he hopped into the passenger seat of a car driven by Terrence “T-Brown” Brown with his nephew in the backseat next to DeAndre “Dre” Smith. Anderson— who was shot and killed in 1998— was one of the prime suspects in Tupac’s murder, and while Davis neglected to identify the shooter, he said that the shots were fired by one of the men in the backseat. We might never know the true identity of the triggerman but I don’t think you’ll have too much trouble coming to your own conclusion. This new custom-made special edition Nissan GT-R50 by Italdesign supercar looks like it came straight out of the Forza Motorsport or Gran Turismo video games because it is absolutely stunning. Much like they did with the $2 million, 610 hp Zerouno Roadster, Italdesign took the guts of already breathtaking, almost perfect supercars and somehow made a car that’s even better. Underneath the new shape, the NISMO organization enhanced the hand-assembled 3.8-liter V6 VR38DETT engine to produce an estimated 720 ps and 780 Nm of torque. Changes to the power plant include optimized twin high-flow, large-diameter GT3 competition-spec turbochargers and larger intercoolers; heavy-duty crankshaft, pistons, connecting rods and bearings; high-flow piston oil jets; revised camshaft profiles; higher-flow fuel injectors; and optimized ignition, intake and exhaust systems. A reinforced dual-clutch sequential six-speed rear transaxle and stronger differentials and drive shafts direct the power to the wheels. When we last met UDOO the team was building a powerful Raspberry Pi-based DIY board with a bunch of impressive features including more ports and a better processor. 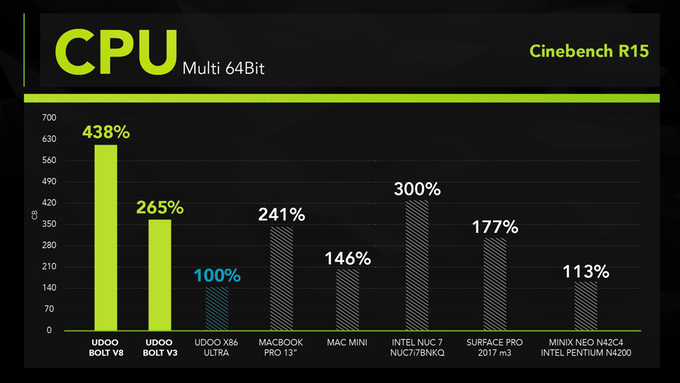 Now the team behind the first units has released the UDOO BOLT, a DIY board that can run “AAA games” thanks to a built-in AMD Ryzen Embedded V1202B 3.2 GHz SoC processor and a Radeon Vega 3 graphics card. 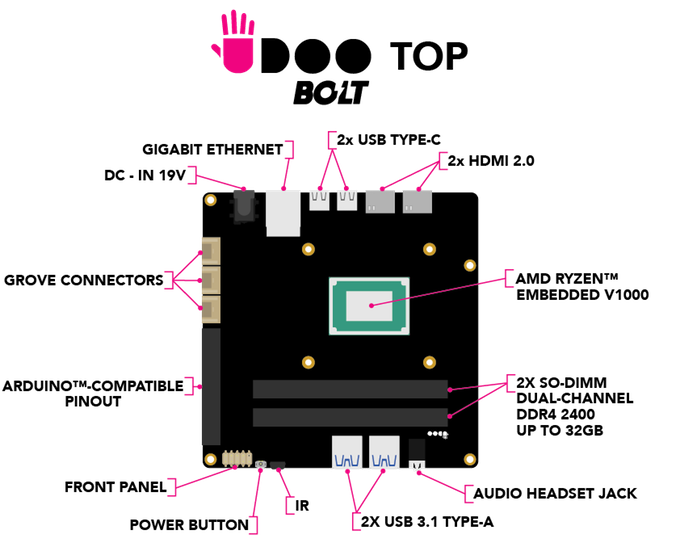 The system is also Arduino compatible so you can connect it to your robotics and other electronics projects. The BOLT, when outfitted with a chunk of RAM, is, according to the creators, “almost twice as powerful as a MacBook Pro 13-inch equipped with an Intel i5 and three times more powerful than a Mac Mini.” Because it is nearly a fully-fledged computer you can stick it into a case and treat it like a mini-workstation with a USB keyboard and mouse and HDMI out to a monitor. The BOLT can drive four monitors at once, two via 4K HDMI and two via USB-C. It runs Linux or Windows. The team plans on shipping in December 2018. The starter kit costs $298 on Kickstarter and includes a power supply and 4GB of RAM. The 8GB unit with SATA and Wireless costs $409. Is a DIY board with a massive processor and graphics card a bit of overkill? Absolutely. However, because the system is designed for experimentation and on-the-fly design, you can easily repurpose a board like this for a kiosk, store display, or workstation. Because it is so portable you could slap a few of these on school desks and give the kids powerful computers that run nearly everything you can throw at them. Plus it’s pretty cool to be able to play VR games on a machine the size of a peanut butter and jelly sandwich. There is a big distinction to be made when it comes to night sky photography, which is whether or not you plan on photographing the stars in the night sky. If you do not plan on including stars in your shots, things are a lot simpler for you. That is true in a lot of ways, in that you don’t need to worry as much about the clouds and weather, the impact of the moon, or light pollution. When it comes to lens selection, it means that you can pretty much use whatever lens you want. Therefore, if that is the type of night photography you plan to do, continue using whatever is your favorite lens at present. On the other hand, if you plan on shooting the night sky and capturing the stars, things get trickier. This stems from two facts. The first is that starlight is extremely dim. It is only a tiny, tiny fraction of what you have at sunset (let alone the middle of the day). Even moonlight is many times more powerful. The second issue is that the stars are moving across the sky (or, rather, that the earth is spinning, but it appears as though the stars are moving to your camera). This is happening more quickly than you might realize. As a result, you need to do everything possible to maximize exposure, and you need for that to happen quickly. In other words, the dim light means that you need a lot of exposure. Exposure stems from a combination of three things: shutter speed, aperture, and ISO. In other types of photography, you might simply open up the shutter for a long time. In night sky photography, however, you don’t have that luxury since the stars are moving. That means your shutter speed is going to be capped somewhere between 15 and 30 seconds. If you expose any longer, the camera will pick up that movement and it will show up as tails or blur in your pictures. That won’t work. That means you’ll have to look at the other two exposure options – ISO and aperture. To deal with the dim light, you will have to crank up your ISO to at least 3200 and in many cases 6400. At present, that’s about as high as you should go. Even if your camera goes up to something like ISO 25,600, as many cameras do these days if you use an ISO that high you risk noise completely taking over your picture. Because of these caps on shutter speed and ISO, the only remaining exposure control is aperture. To maximize exposure and still successfully capture the night sky, you will need a fast lens. How fast? A lens that opens up to f/2.8 or wider is ideal. A lens with a maximum aperture of f/4.0 is acceptable. Anything less than that (meaning a higher f-number) probably won’t work. This is one situation where your kit lens might serve you well. Most kit lenses open up to f/3.5 at their widest focal length, which is actually 1/3 stop brighter than your typical f/4.0 lens. As a side-note, you might be worried about depth of field when using these large apertures. You need not worry about that though. You will always set your focus at infinity and everything in your scene will be on that plane of focus. Even if there are objects in the foreground, at wide angles things quickly go to infinity on your lens. Unless something is very close to you (say, within 10 feet or so), it will be on the same plane of focus and depth of field will not be an issue. If you want to include anything closer than that, you’ll likely need to focus stack. You may be familiar with something called the Reciprocal Rule. It will help you make sense of why you need a wide angle lens for night sky photography. That rule states that the slowest shutter speed (exposure time) you can use when shooting handheld and still avoid blur in your pictures is the reciprocal of your focal length. So, for example, if you are using a 100mm lens, your minimum shutter speed should be 1/100th of a second. This rule shows that there is always a direct correlation between focal length and the longest shutter speed you can use to avoid blur. That also holds true when it comes to photographing the stars. When you photograph the night sky, the wider the lens you use, the longer you can open up the shutter. How wide of a lens do you need? There is no clear answer. If you are familiar with photographing the stars or the Milky Way, you may have heard of certain rules of thumb where you divide a number by the focal length of your lens to get a maximum exposure time (such as the Rule of 600, 500, or even 400) before the stars start to arch and blur. For example, using the Rule of 500, a 24mm lens would allow you to use a shutter speed up to 20 seconds (500 divided by 24 mm is 20.8 seconds). But if you use a 16mm lens instead, you can expose up to 30 seconds (500 divided by 16 is 31.25). As you can see, wider is better. Here is how it works out for the widest focal lengths. Before moving on, let me point out two things about this standard. First of all, it is not absolute, and there are those who advocate for a stricter standard (meaning that you should use even shorter shutter speeds for these focal lengths). Be sure to test out different speeds and see what works best for you. Second, if you use a crop factor camera, be sure to adjust these numbers to the Effective Focal Length, which is based on a full-frame or 35mm format (i.e. 20mm on a 1.5x crop factor camera is effectively a 30mm, so the maximum exposure then is only 16.7 seconds before the stars arch). It goes without saying that you want a sharp lens. But how do you determine what is a sharp lens and what isn’t? The best way, of course, is to try them out for yourself. It may not be practical to test out a whole series of lenses though. We all rely on lens reviews. I’m certainly no expert on optics, so I definitely do. These are usually extremely helpful, but sometimes it is difficult to get an apples to apples comparison of different lenses. To do that, there is an extremely helpful resource called DXO Mark. The reason DXO Mark is so helpful is that they score all lenses in the exact same manner. For example, they give scores for sharpness, distortion, and vignetting (as well as other criteria, and an overall score) and grade each lens the same way. That lets you look at numbers very quickly, rather than comparing images from different lenses and attempting to quantify the differences. If nothing else, it gives you a good place to start. Of course, sharpness isn’t the only thing you need to consider. Lenses all have different amounts of distortion as well. One type of distortion that is important in night photography is called coma distortion. It adds little wings to points of light, which in the case of photographing stars is not ideal. Unfortunately, this is not something that is often included in lens tests, so you’ll have to check for this with whatever lens you are considering. We have now established the three most important criteria for picking a lens for your night sky photography. Your lens needs to be wide, fast, and sharp. In terms of how wide, how fast, and how sharp, that is up to you. But you can use your own criteria to create a list of available lenses. For example, you might decide to only consider lenses that are 20mm or wider, open up to f/2.8, and are at least moderately sharp. Once you narrow the list down to your particular brand of camera, you will probably find that the list is not very long. There may actually only be a few models from which to choose. That’s not to say you necessarily need to rush out and purchase one of these lenses. The point of this article is really to help you establish the criteria for picking your own lenses. At the same time, I don’t want to be coy about these obviously great lenses, as they fit the criteria for night sky photography very well. When you start putting price limitations on lenses, the list gets short real quick! Most lenses in this range cost well over $1000, and many approach $2000. You may be looking for something more affordable, as I was. Once I looked at the list further, the Tokina 16-28 mm f/2.8 jumped out at me. It is under $700 in most places and meets all three criteria of being wide (16 mm), fast (f/2.8), and sharp (scoring a 22 on my camera per DXO Mark). I picked one up and like the results. It works great, although there is definitely some coma distortion going on. Still, for the price, it is a great option. This lens is available for both Canon and Nikon cameras. There is another affordable option if you don’t mind manual controls – Rokinon lenses. They have several wide angle options to choose from, ranging from 12-24mm. They are prime lenses and are very fast. All have maximum apertures of at least f/2.8. These are all manual lenses though, which means that you will need to focus manually. It also means that you will set the aperture with a ring on the lens, rather than with your camera. Still, that should not be a problem with night sky photography. You just set the lens at its widest aperture and set the focus at infinity. You might never change it. Because of these manual controls, you can often pick up these lenses for well under $400 (check out the Rokinon 14mm). Again, this is just another good option if you don’t mind manual control lenses. Note: Rokinon also has 12mm and 8mm fish-eye lenses available with mounts for Canon, Nikon, Sony, Fuji, and Micro 4/3 cameras if you want to go really wide. Just remember that if you are considering a lens for night sky photography, you’ll want to limit the lens selection to wide-angle lenses (generally 24mm or wider). You can get away with longer focal lengths, but you’ll need them to be extremely fast (probably f/2.0 or greater). Once you have narrowed down your selection in this fashion, look at fast lenses. Try to get one that opens up to f/2.8 or better. That usually means you are looking at fairly expensive lenses, but as mentioned above there are some affordable options that will get the job done. After that, be sure to check the DXO Mark ratings. But don’t stop there – a simple Google search for the lens(es) you are considering will likely yield a lot of reviews. I am partial to The Digital Picture and DP Review as well. Hopefully, this article has gotten you familiar with the criteria you need from a lens for night sky photography and has spurred a few ideas. It isn’t meant to limit your alternatives, so if there are other lens options I’ve missed, please let me know in the comment area below. The post How to Choose a Lens for Night Sky Photography appeared first on Digital Photography School. 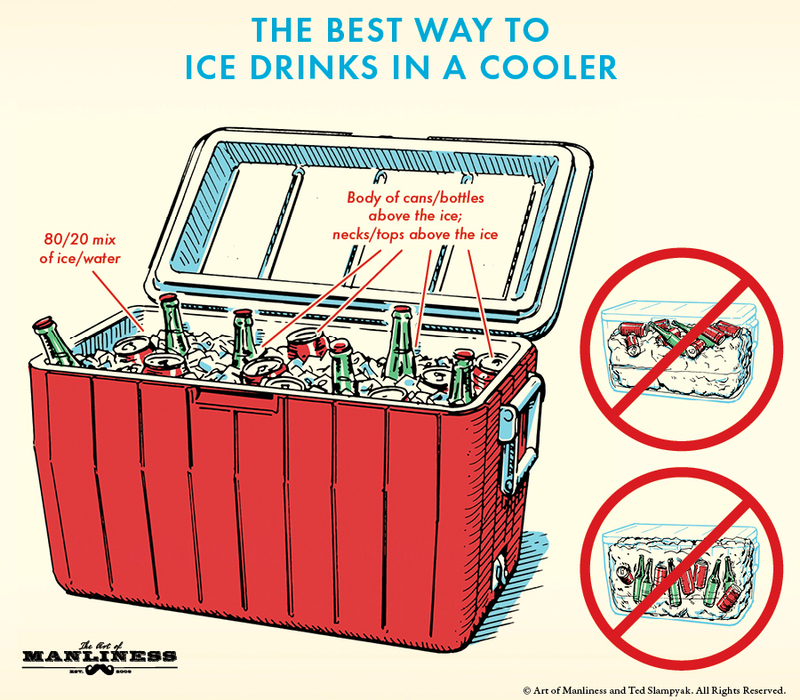 The post The Best Way to Ice Drinks in a Cooler appeared first on The Art of Manliness. Nearly half of Americans believe aliens have visited Earth, according to a poll. The Drake equation explores the chances that detectable alien civilizations exist using seven variables. While some predictions that use the equation are optimistic, a comprehensive new study suggests a strong likelihood that we’re alone in the Milky Way galaxy. There’s also a roughly 38% chance that humans are completely alone in the visible universe. A majority Americans believe in UFOs and just under half think extraterrestrial beings have visited Earth, according to a 2015 poll of about 1,000 adults in the US. Though people in the US can barely pass a basic science quiz created by the government, it’s tempting to climb aboard the extraterrestrial train: There are hundreds of billions of galaxies in the visible universe, hundreds of billions of stars per galaxy, and untold numbers of planets around each star. It’s easy to imagine that alien life, perhaps an intelligent kind, is out there somewhere. But scientists aren’t sure one way or the other. Their go-to expression for this alluring possibility — and deep-seated doubt — is the Drake equation. 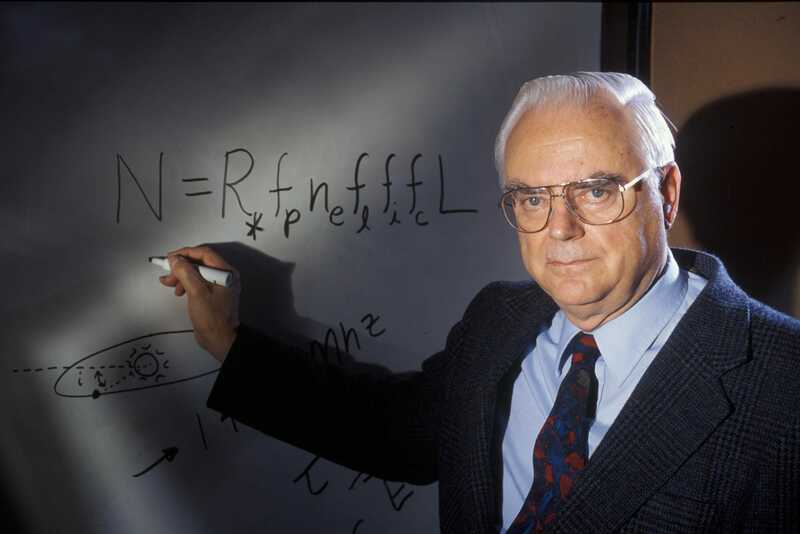 Astrophysicist Frank Drake drew up the famous formula on a chalkboard in 1961. This was at the dawn of a worldwide search for extraterrestrial intelligence (SETI), and his thinking continues to influence the use of astronomical observatories to this day. The equation is more of an argument wrapped in seven variables. Multiplied together, these variables yield a calculation of the possibility that humanity might someday hear from an intelligent civilization. "Although there is no unique solution to this equation, it is a generally accepted tool used by the scientific community to examine these factors," the SETI Institute says of the Drake equation. The first letter of the Drake equation, on the far left, is its solution, "N." It represents the number of intelligent alien races within the Milky Way that could be broadcasting signals detectable to Earth. As you move right in the equation, the variables grow increasingly difficult to estimate. R* = The rate of formation of stars that are suitable for the development of intelligent life. ne = The number of planets per solar system that have an environment suitable for life. fi = The fraction of life-bearing planets on which intelligent life emerges. fc = The fraction of intelligent civilizations that develop a technology that releases detectable signs of their existence into space. Scientists have a good handle on the first two variables, R* and fp, and are increasingly certain about the third, ne. However, the other variables farther to the right all deal with the bold hypothetical of life actually existing elsewhere in the universe. This is something we have no definitive proof of — not even for a bacterium. As a result, all solutions to the Drake equation are enormously uncertain. Are we alone in the Milky Way — or the universe? Scientists’ uncertainty about intelligent alien life is illustrated by their extraordinary variety of solutions to the Drake equation. 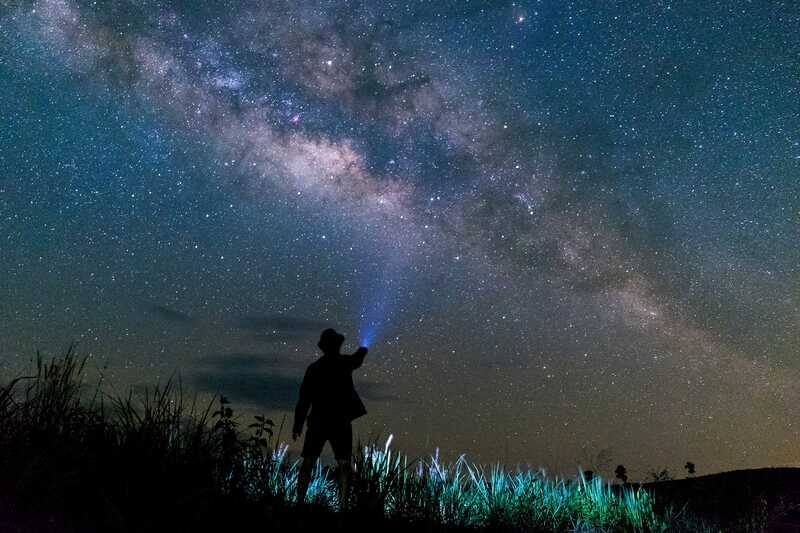 In a draft study posted online in June, three researchers at Oxford University’s Future of Humanity Institute looked at all the studies they could find that touched on Drake equation variables. Then they crunched some numbers. The researchers found that about two thirds of studies guess that some 100 advanced alien civilizations might exist in the Milky Way galaxy. However, the highest estimates come in at 100 million civilizations per galaxy, and the lowest guesses are as low three civilizations per 10,000 Milky-Way-like galaxies. That is a 100-billion-fold difference in predicted abundances of intelligent, communicating beings. "It is common to see carefully estimated astrophysical numbers multiplied by these ad hoc guesses," the authors wrote. "It has been noted that the final results seem to depend heavily on the pessimism or optimism of the authors." In hopes of better lessening that uncertainty, the Oxford researchers — Anders Sandberg, Eric Drexler, and Toby Ord — reformulated each Drake equation variable as a range of uncertainties. Their work produced a bell-curve-like distribution of results. And they were bleak. 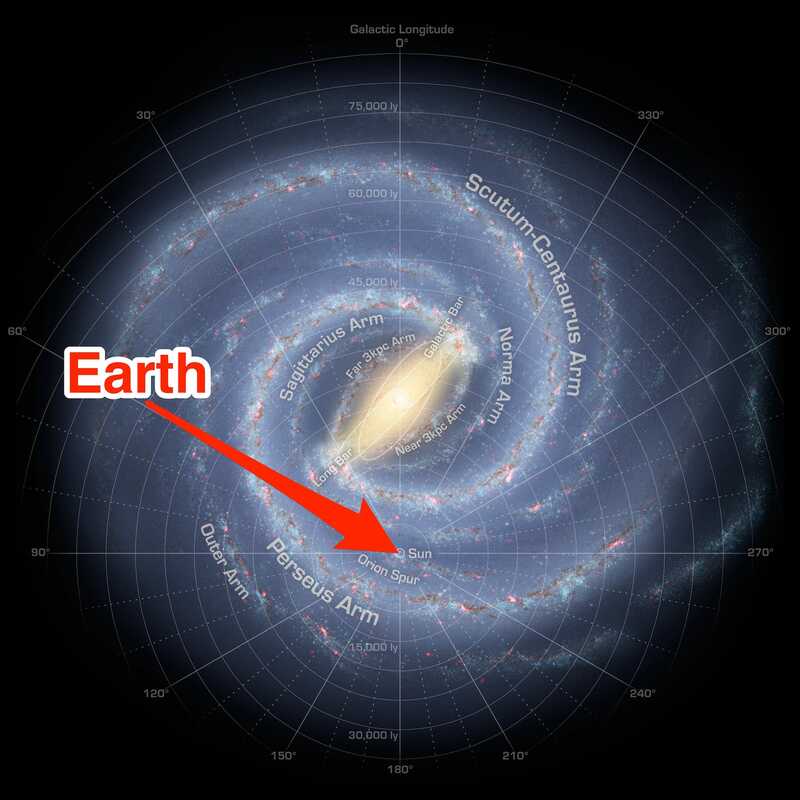 The average probability (toward the middle of the curve) that we’re alone in the Milky Way came to about 52%, with a 38% average chance that we’re alone in the entire observable universe. Even the most optimistic, better-than-average values were depressing: The authors calculated that there’s a 41% chance we’re alone in the galaxy and a 32% chance we’re alone in the visible universe. "We find a substantial probability that we are alone in our galaxy, and perhaps even in our observable universe," they said. So the next time you gaze at the stars and wonder if aliens are out there waiting to be found, flip a coin. That may be our best representation of the chances we’re alone — and perhaps all the more reason to seed the cosmos with human life. SEE ALSO: The space between Earth and the moon is mind-boggling. This graphic reveals just how big it is — and what’s out there.